Because heat naturally rises, a process known as thermal destratification, valuable heat is constantly rising away from where it is needed, where it forces down cooler air into the occupied space beneath. 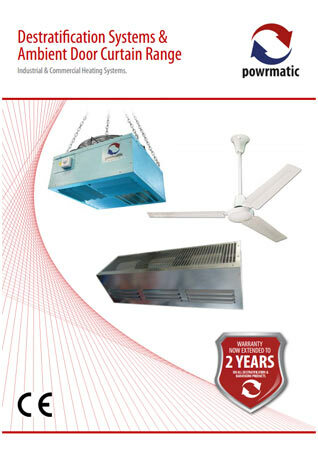 To minimise the effects of this process, Heathcrest can install powerful overhead fan units, to recycle the warm air, improve working temperatures and significantly reduce wastage through lost energy. In most workspaces, irrespective of the height of the ceiling, the occupied space where people need to be kept warm is up to around 2 metres from the floor. Energy used to heat the air above this point is usually wasted energy. In a typical pitched roof building with an average height of 5-7m, the temperature difference between the working area and the roof space above will be around 5°C. Destratification fans working in harmony with a warm air heating systems, return the warm air from the roof space back to the occupied space, maximising energy use. Low velocity blade or propeller fan– These work by churning the air and are most appropriate for ceiling heights between 5m and 10m. 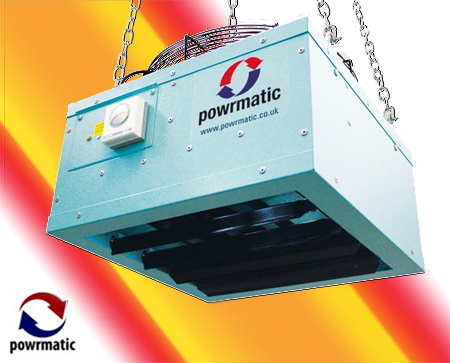 High velocity axial fan – These send a significant amount of air at high speed towards the floor and are best for heights of 10m to 20m. Fans only come on when heating is on. Fans are controlled independently of the heating. Fan operation is linked to air temperature at ceiling height. Speed control to prevent draughts.